Tiramisù is one of Italy’s favored desserts and probably one of the country’s best known culinary exports. We have already given you the recipe for the traditional version of this delicious treat, as well as some interesting info about its history. One thing about tiramisù we almost never consider is its versatility: the traditional, basic recipe can be changed and varied in many ways, always creating a fantastic result. The tiramisù recipe we propose here is a fresher and lighter version of its traditional counterpart, where mascarpone is swapped with greek yogurt and eggs and coffee with strawberries. I call it Summer tiramisù because, of course, it needs the freshest of fruit and this is the right season to get it. I must admit, this is not my own recipe, but my stepmother’s, who is a great cook and could teach a thing or two to many chefs out there! The base for this tiramisù is, of course, savoiardi, which are called lady’s or boudoir fingers in English. In case you cannot find them, you can either make them yourself (they are pretty simple to prepare!) or substitute them with a plain, sponge cake, of the type you find at the store ready to be cut and filled with creams and frostings. I would avoid crunchier cookies for Summer tiramisù: if they work very well as an alternative to savoiardi in the original recipe, they may not be the best for this one. Stick with lighter, fluffier cookies so! One last thing: as you will see, I soak savoiardi in fresh orange juice instead of coffee, but if you prefer, you can get some extra strawberries and blend them to make a coulis to use instead. It is really up to you! Whip the cream with the sugar and the vanilla essence. The vanilla essence is, of course, not necessary if you chose vanilla flavored greek yogurt. I usually add 3 to 4 tablespoons of sugar to the mix, but it is really quite personal: if you like it sweeter, add more, if you like it less sweet, stick to only a couple. Once it is ready, add the greek yogurt and stir gently until you obtain a smooth mixture. 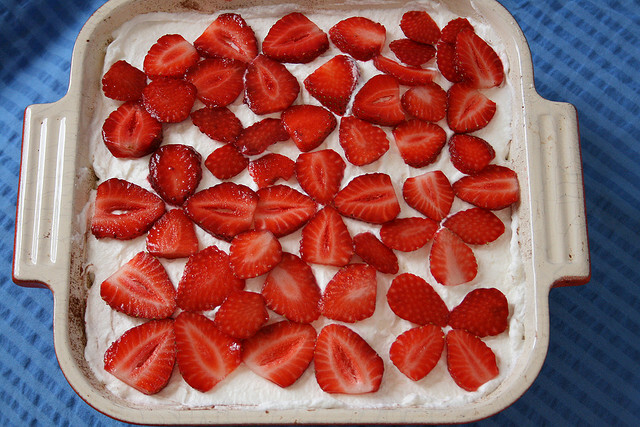 Once you are finished with that, place the mixture in the fridge and take care of the strawberries. Now, they must be fresh strawberries, not frozen! Wash them and slice them or dice them, if you prefer them that way. Now all your ingredients are ready to be assembled into our Summer tiramisù. In a medium sized oven or cake dish with borders a couple of inches high, start layering the cookies soaked in orange juice, the cream and the sliced strawberries. Repeat two or three times, depending on the size and depth of your dish. 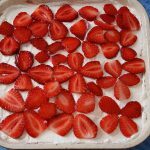 You should always end with a layer of cream, to be decorated with some more fresh strawberries and, if you are into it, some white or dark chocolate shavings. Place in the fridge to set for a couple of hours and voilà, the Summer version of a classic is ready to be enjoyed!